Compañeros and compañeras, receive a combative greeting from the children, women, men and elders of the people of San Sebastián Bachajón. On September 24th we remembered our fallen compañero Juan Vázquez Guzmán, 5 months after he was cowardly murdered by the bad government on the night of April 24th, 2013 when he was resting at home, the murderers shooting him with a firearm. The memory of compañero Juan Vázquez Guzmán is our strength as an organization to keep fighting and defending our territory from plunder by the bad government which does not cease wanting to destroy our organization. We inform you that our organization of the Sixth Declaration of the Lacandon Jungle has made an agreement to begin working a new gravel bank in the territory of San Sebastián Bachajón to meet the needs of the ejidatarios, the name this bank will carry is Nah Chawuk. Our idea comes from seeing so much repression from the bad government and the corruption and abuse from the ejidal commissioner Alejandro Moreno Gómez, together with the former ejidal commissioner Francisco Guzmán Jiménez, who destroyed the ejido’s gravel bank through uncontrolled exploitation and did not make themselves accountable to the ejidatarios for using the resource, they just put it in their purse and that of the politicians. These people who truly behave like organized criminals only seek their own personal gain and the people are an obstacle to them. The new gravel bank Chawuk Nah will be for the benefit of all the people, not like Alejandro Moreno Gómez and the other corrupt commissioners do, who make money for their purse, they just exploit and profit from the mother earth while the people and the ejidatarios are discriminated against and completely marginalized by these bad authorities who do not seek the collective benefit, but only benefit their people from the political parties and people from the government who make their purses richer by making Mother Earth into a business. So as an organization of ejidatarios we determined to begin work on the Chawuk Nah gravel bank to meet the needs of ejidatarios and for the collective benefit of the people. We hold the federal, state and municipal governments and also the ejidal government of Alejandro Moreno Gómez responsible for any aggression, threats and repression which they try to do to impede our work as an organization and as ejidatarios on the Chawuk Nah gravel bank. We are now looking at how these corrupt authorities are buying the communications media of Cuarto Poder to publish lies and tarnish our organization, with information published on September 25, from an alleged journalist, by name Juan Sanchez, where it says that it is affecting the ecological reserve in the ejido and that it will cause confrontation between 7 thousand ejidatarios, but this is a lie because the ejidal map says that the hilly area is designated for a gravel bank, but Alejandro Moreno Gómez does not have the ejidal documents and only does what he is told to do by the bad government and Francisco Guzman Jimenez (aka the goyito); this is how pure falsehoods arise in order to suppress and destroy our organization, which is the only one which is struggling to defend the dignity of its people, because they have already sold themselves. In the ejido there were originally about 2 thousand ejidatarios, but the government has inflated the census of ejidatarios in the National Agrarian Registry to 4 thousand to better impose their frauds on the election of ejidal authorities. Our organization is peaceful and does not provoke confrontations, our organization defends the territory and the mother land from the capitalist projects of the bad government, this bad government and the ejidal authorities who obey them are the provocateurs, they generate violence in the ejido and are the murderers of social activists like Juan Vázquez Guzmán. These bandits are the same ones who keep up the dispossession of our territory and who have illegally changed the coordinates of the decree of 1980 for the natural protected area of the waterfalls of Agua Azul in order to dispossess the ejido, with the police violating the law and human rights. The bad government does not like our organization to work independently without asking it for scraps and to live our autonomy without asking it for permission, it only wants to see us bent over and obedient like slaves. We demand that the three levels of government respect our organization and our autonomy, we hold them responsible for any aggression, threats and harassment against our work and the compañeros and compañeras of the organization. We demand the immediate release of our compañeros ANTONIO ESTRADA ESTRADA, unjustly imprisoned in Playas de Catazajá, Chiapas, and MIGUEL DEMEZA JIMENEZ, in El Amate in Cintalapa de Figueroa. 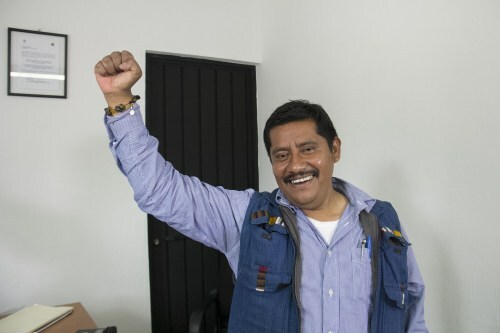 We deplore the decision of the First Collegiate Circuit Court in Tuxtla Gutierrez not to release the compañero and social activist ALBERTO PATISHTÁN GOMEZ, but we will not rest until we achieve his freedom and that of our political prisoner compañeros. From the northern zone of Chiapas, receive a hug from the women and men of San Sebastian Bachajón. Freedom for Alberto Patishtan Gomez! The “reforms” are not what they purport to be. To hide their character and defeat those who resist, they have mounted propaganda campaigns rather than government actions. While public attention is caught up in the media game, the most serious and damaging of the alleged reforms is creeping forward: the food plunder, the liquidation of our corn and of the culture that allows us to continue to be who we are. Education, the energy sector and public finances do not reform. They strip the teacher ranks of some of their rights and increase bureaucratic control of education in order to continue dismantling it. They strip the country of part of the oil revenue and of control over its energy resources in order to continue dismantling Pemex. The tax system is adjusted to raise revenues marginally without touching the structural problems of public finances. All this is, of course, at the service of a few. The anti-peasant policy adopted by the government in the post-war period is arriving at an extreme end. It is the elites’ unshakeable conviction that the country cannot fully modernize while so many campesinos and indigenous remain in the rural areas. They have to be expelled. This foolish policy, which uses the foundation to build the roof, has caused immense damage. One of the most severe is the policy aimed at undermining Mexico’s Corn Culture in all its aspects. The final blow is currently being prepared, even worse than the one in 1992, when Article 27 was amended to make ejido land [owned and worked communally] available for sale on the open market. The authorities are about to approve permits to grow GM corn on two and a half million hectares. We set aside here the intense debate about the intrinsic harm of this kind of corn. What matters most is the disaster that it will cause. These crops will contaminate at least 5 million in which only native corn adapted to different ecological niches through millennia of selection can thrive. By spreading transgenic corn in these fields, it would not be possible to grow [native] corn there. 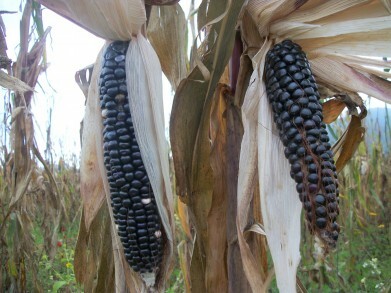 The transgenic corn will be produced by commercial agriculture and in suitable areas, but it does not have the qualities of native corn adapted to those niches. By making it impossible to plant corn on these millions of acres, the small farmers would be forced to abandon them. So the reason for the manoeuvre is revealed. It could be to carry out more smoothly the land dispossession that has been tried through concessions [e.g., licenses to mining companies, wind farms, etc.] and that is facing growing resistance. A few days ago in these pages, Silvia Ribeiro showed the importance of the peasants (La Jornada, 09/21/13). She pointed out that the industrial food chain controls 70 per cent of the land, water and agricultural inputs, but what they produce reaches only 30 per cent of the world population. The remaining 70 per cent is fed with what campesinos produce. Victor Quintana, meanwhile, showed that current actions try to put corn cultivation under control of multinationals, Monsanto, in particular (La Jornada, 27/09/13). The company faces growing challenges in the United States from a citizen movement increasingly aware of what its operation means. Today, the “Monsanto Protection Act”, underhandedly introduced in March, will probably die in the [U.S.] Senate. Thus the company has intensified its activities in countries such as Mexico, where the authorities are obliging. 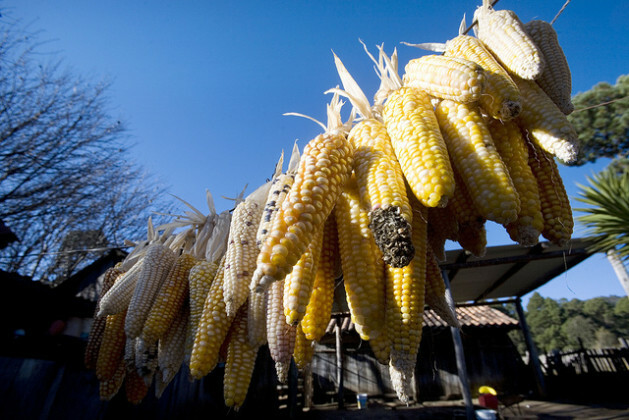 Ten years ago, the severity of the damage caused by official policy inspired the campaign Without corn there is no country [Sin maís no hay país] that persists today. It has helped to deepen awareness of the consequences of this policy for the country, which were clearly stated yesterday at celebrations of National Corn Day. Equally, it deepens awareness everywhere of the meaning of the threat posed by genetically modified plants. While the world gradually extends the ban on their use, the Mexican government is determined to promote it. It makes sense, no doubt, to express radical rejection of provisions presented as “reforms” and that promise the opposite of what they actually cause. But it is not giving enough importance to the case of corn and peasant farmers. Ultimately, although it might be with great difficulty, we could live without oil and without education. But we cannot live without food. If they continue to destroy our ability to produce food, they would have irresponsibly created the worst dependency, that of the stomach, a real threat that is almost accomplished, against which it is essential to react. Yaqui Indigenous have delivered more than 9,000 signatures to Mexico’s environmental enforcement office demanding a halt to construction of an aqueduct in the northern state of Sonora they say will leave them without water. The petition was launched on the Web site Change.org by members of the Yaqui’s head town, Vicam. A representative of that indigenous community, Mario Luna, delivered the letters to the environmental enforcement chief, Francisco Alejandro Moreno Merino; the office’s delegate in Sonora, Jorge Carlos Flores Monge; and the federal government’s environment and natural resources secretary, Juan Jose Guerra Abud, the village of Vicam said in a statement. On Feb. 23, 2011, the Environment and Natural Resources Secretariat, or Semarnat, authorized construction of the Independence Aqueduct without respecting indigenous peoples’ right to be consulted about projects affecting their resources, a court in Sonora ruled four months ago. On Aug. 7, the Mexican Supreme Court ordered the Sonora government to halt construction of the aqueduct if it is found to cause “irreparable damage” to the Yaqui community. In the wake of that ruling, Semarnat revoked the environmental permit that had been issued and announced that consultations would be held with the local community by the end of September or early October. But the Sonora government has continued to build the aqueduct. The goal of the project is to supply water to the booming manufacturing hub of Hermosillo, Sonora’s capital, by taking it from the Yaqui River, which “is drying up” as a result, the petition says. The Yaqui tribe consists of some 45,000 people spread across eight small towns and 56 hamlets, none of whom currently has running water, according to the letter. Inatoy Sidsagi and his cousin Esteban Herrera, from the indigenous Kuna Yala (also known as Guna Yala) nation in Panama, make up the indigenous rap group Kunarevolution. They rap about Mother Earth and the Kuna’s inalienable right to protect their lands and waters. The Kuna Yala people recently prevailed over a threat to their lands, in the form of carbon trading. REDD (Reducing Emissions from Deforestation and Forest Degradation) is a global program promoted by the U.N., industrialized nations, and international financial institutions like the World Bank. REDD allows countries and corporations to buy “clean-air” credits from countries with undeveloped forests. In exchange, governments, indigenous nations, and other groups agree to preserve areas of their forests, with the rationale that the trees’ absorption of carbon, the element that causes global warming, will counteract damage done by industrial polluters. Indigenous nations and social movements around the world have been denouncing REDD. To amplify their dissent, they have been forming alliances, gathering at international climate talks, and protesting. They insist on upholding an old concept which has recently been gaining currency as Mother Earth rights. This means that rights of the earth are intrinsic, and cannot be given or taken away by governments or international institutions. The framework is being used both to spread the worldview that the riches of nature should not be considered commodities to be bought and sold, and to mobilize people to unified action. “I do not lose hope, I will keep fighting. 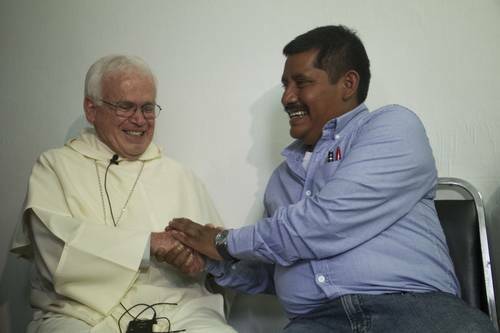 For the love of life itself and the love of justice is above everything.” So Patishtán spoke optimistically to the media today at a press conference held after the Mass for the day of the prisoner and the launch of the book “Accompanying hope”. It was no coincidence that this book, published by the Network All Rights for All [la Red de Todos los Derechos Para Todos] was launched in the CERSS 5 with the presence of Patishtán. In fact, the Tsotsil teacher appears among the eight accounts it contains of great fighters for human rights. What is paradoxical is that less than two weeks ago Mexican justice ratified the conviction of this prisoner in struggle. “It is difficult to accept the decision made by the first collegiate tribunal in Tuxtla Gutierrez, the ratification of 60 years for an innocent man”, Martín Ramírez López, a member of the Movement of the People of El Bosque, said with regret. There were many people who attended the event to see and hear the words of Professor Patishtán. But many also came to visit their own family members and to celebrate with them the day of the prisoner. In fact, today, CERSS 5 could have looked like anything other than a prison, if it were not for the endless bars and the long queues to enter. Even Raúl Vera, Bishop of Saltillo, and Felipe Arizmendi, Bishop of San Cristóbal de las Casas, joined the event. The celebration began at 10 am with a Mass attended by prisoners and their families. Then, in a corner of the prison yard and under the eyes of many prisoners who were enjoying the day with their families, the book “Accompanying Hope” was introduced. Agnieszka Raczynska, executive secretary of this organization, was in charge, and she was followed by participations from members of the Fray Bartolomé de las Casas Human Rights Centre or of Serapaz. The demands of the teachers and the account of the current situation of the teachers’ struggle were also included in the meeting, thanks to an intervention from a teacher from section 7 who invited the audience to support this cause, which is so related to human rights. However, the most anticipated moment was the awarding of Recognition of Innocence to Alberto Patishtán. His compañeros from El Bosque took the opportunity to give him a framed recognition of innocence. “It is not only my people, there are also very many people throughout the world who recognize my innocence. Unfortunately the authorities have closed their ears and eyes,” said the professor. “My conscience gives me freedom and keeps me strong and fearless”. And if your name is Alberto Patishtán, hope will never be lost. Martin Ramirez finished by saying: “We have a plan and that is to free Patishtán”. Hundreds of members of organizations fighting social and environmental catastrophes in their communities denounced a “national emergency” in Mexico’s water systems. Participants in the national hearing of the Permanent People’s Tribunal, Mexico chapter on the “Devastation of National Hydrologic Systems” held in San Miguel de Allende, Guanajuato, Sept. 20. The Tribunal, headquartered in Rome and inspired by the Russell Tribunal that judged war committed in Vietnam war, is considered an “ethical tribunal”, meaning that although its sentences are not legally binding, it seeks to bring to light human rights violations against the peoples, coordinate and provide a public forum to citizen’s complaints, and pressure governments to assume responsibility for their acts. The Mexico chapter is hearing cases of abuse of power by the Mexican state in benefit of national and foreign companies and attacks on the rights of the population. It is divided into seven areas: dirty war, structural violence and impunity; violence against migrants and forced displacement; femicide and gender violence; workplace violence and violations; destruction of agriculture and native corn; environmental destruction; and misinformation, censure and violence against journalists to document nationwide violations of rights generated particularly in the context of the North American Free Trade Agreement (1994) that opened up the country to foreign investment and the entry on a massive scale of transnational corporations. The cases presented to a panel of experts reflect serious social problems that are hidden in the media and unattended by federal and local governments. They also provide a basis for further potential legal actions in national and international courts. Thirteen cases were presented at the San Miguel hearing to demonstrate, through personal testimony of victims and in-depth studies, the destruction of watersheds and hydrologic systems that have caused multiple damages to the local and regional populations, violations of individual and collective human rights, health problems and environmental destruction. All cases reported a lack of access to and response from the Mexican justice system to stop damages and redress harm. Representatives of community groups and non-governmental organizations from throughout the country denounced their cases, the vast majority presented by women who make up the bulk of local activism in defense of water. The jury divided the cases into three blocks: water pollution, over-exploitation of aquifers (water depletion), and water diversion. The host organization, the Coalition in Defense of the Independence Watershed (CODECIN) stated that the aquifers in their region of Guanajuato have been depleted, resulting in deeper wells to supply water. The lower level water is full of minerals toxic to human beings. The area of the Laja River, including San Diego de la Unión, Dolores Hidalgo, San Miguel de Allende and four other townships distributed in 7,000 km2 — a fourth of the state of Guanajuato—face problems of desertification, depletion of aquifers and contamination of water with fluoride and arsenic. The aquifer is intensively pumped to provide water for nearly 60,000 hectares of irrigation, most for large-scale export crops, favored with low water rates and subsidized rates for electricity and other services. Fluoride and arsenic are found in the water for human consumption from two to ten times the official norm. Fluoride causes osteoporosis, pain in the bones and the elimination of enamel on the teeth leading to staining and deterioration. Arsenic causes neurological damage and cancer, among other serous affects. Following the scientific studies, five women from local villages described the health affects. A woman from Terreros broke down in tears as she narrated how her children have suffered as a result of the health effects of fluoride poisoning and the lack of response from government authorities, despite being aware of the problem for years. “We still are seeing little children with stained teeth,” she said. “The water is running out, we don’t know how long we have left.” She said it cost nearly two thousand dollars to fix her oldest daughter’s teeth. Her husband was forced to migrate to the United States and she cannot afford medical attention for her children’s multiple ailments. When the moderator asked for all those affected by poison drinking water in the Independence watershed to stand up, a stir went through the audience. More than a hundred men, women and children rose—many with evident signs of harm in the skin and teeth. The organizations Consejo Estatal de Pueblos Indígenas de Guanajuato, Va por San Miguel de Allende, Charco del Ingenio and Frente Pro Patrimonio added the problem of the highway proposed between the cities of Silao and San Miguel de Allende. The highway would destroy wetlands, divide rivers, and damage more than 70 important archeological and cultural sites. The project consists of building a 60-meter wide highway, whose approval process lacked an adequate environmental impact study or consultation with local indigenous and nonindigenous populations. The group Lagunero Citizens Association presented another case of overexploitation of aquifers due to unrestricted use by private industry. In the northern region of La Laguna, located in parts of the states of Coahuila and Durango, the dairy production giant, LALA, has been the main factor in water depletion, local residents stated. The company has leased or bought land from ejidos and local communities and controls 80% of the water supply in the region. It takes 2,400 liters of water to produce a single liter of milk, leading to massive drilling of new wells and deepening of existing wells. The economy in this part of the country had already been devastated by free trade policies that wiped out cotton production and prolonged droughts exacerbated by climate change. Rural dwellers have been forced to hire out as day laborers on cattle ranches or the offshore assembly plants (maquiladoras) or cross the border to the United States to look for work. Now the lack of clean water is another obstacle. “When the water runs out, LALA can just grab their cows and go somewhere else, but what are we supposed to do?” asked the presenter from the local water defense group. The Coalition for Atoyac Alive related that the Atoyac River, in Puebla and Tlaxcala, is one of the ten most contaminated rivers in the country. Residents reported that its repulsive odor and toxic fumes invade their communities and it gets worse at night, creating an almost unbreathable atmosphere. Since the eighties, three industrial parks operate in the region with factories of ceramics, thread and cloth, and food colorings. The textile, soft drink, pharmaceutical and agroindustrial industries all use the river for their production in the area and there is also a petrochemical complex owned by PEMEX, the national oil company. The local organization documented a history of neglect by government officials. They claimed that the federal government has violated laws in failing to apply environmental laws and favoring industrial use of water over domestic and agricultural use. Authorities do not carry out inspections, or apply regulations, they have not developed sanitary programs or programs for prevention and attention to victims of pollution and poisoning. The result is water grabbing from communities to industry and many economic and social impacts, including the devaluation of their crops on the market since they are watered with contaminated water, gravely affecting their livelihoods. Faced with high levels of toxicological damage, illness and disease including cancer, the local organization demanded closure of highly toxic industries that dump residues in the river and announced that they will keep up the pressure because “there is no social justice without environmental justice”. Perhaps the worst case of industrial water pollution presented in the hearing came from the state of Jalisco, home of the Rio Santiago. A brief video shows scenes of a river white with chemical foam, a victim of uncontrolled discharges from factories and the sewage from the city of Guadalajara that is dumped into the river. More than a thousand contaminants, including heavy metals, converge in a toxic stew in the previously pristine waters o the Santiago. More than 120,000 people live in El Salto, 20,000 in the county seat. The population suffers from many illnesses, as well as the loss of agricultural activities, and the deterioration of its lands and livelihoods. Industry causes 80% of the pollution, dumping sulfuric acid and arsenic into the river. The loss of the river is a fact of life for residents. “No one in their right mind would dare to drink from that river,” the representative of El Salto for Life, the local environmental organization, told the jury. The organization demanded that government officials responsible for the ecological disaster be held responsible, that the area be declared an environmental emergency zone and that effective measures for clean up and restoration be adopted immediately. In Veracruz, another Atoyac River, is severely affected, reported a group from that state. Polluted by industry and slaughterhouses, the river born clear in the jungles of Amatlán de los Reyes, near the mountain Pico de Orizaba, is dying due to contamination and deforestation. Companies that dredge riverbed materials for sale also contribute to destroying the river and the area is losing its rich biodiversity, the environmental study reports. The latest threat comes from a plan to pump water from near the head of the river to the city of Cordoba to supply some 6,000 residents without drinking water, according to government promoters. Defenders of the river claim that in reality the government seeks to benefit industries, and demand that the water-diversion plan be cancelled. Another case of nature under attack by unregulated and uncontrolled economic activity came form the so-called “Riviera Maya”, tourist development along the coast of Quintana Roo. There the largest system of subterranean rivers on the planet and home of ancient cultures is rapidly deteriorating due to pollution. Other cases presented at the hearing reinforced the crisis situation facing the nation. Some presenters were unable to attend due to double hurricanes hitting the nation and the massive damages incurred. Last November, the National Assembly of Environmentally Affected Communities presented a complaint to the Latin American Water Tribunal against the three levels of government—federal, state and local—and the executive, legislative and judicial branches of government for the destruction of the national hydrologic systems, based on a broad study and collection of cases carried out over the past five years, concluding pollution caused by mining companies, the use and abuse of agro-chemicals and pesticides and inadequate urban infrastructure. The Assembly maintains that in the last 60 years available drinking water per inhabitant has been reduced by 75% and in the next 15 years it will go down another 75% from current levels. Octavio Rosas, a leader of the Assembly, stated that in Guanajuato, due in part to criminal abuse of power by agro-exporting magnate and former Sec of Agriculture, Javier Usabiaga, and other businessmen and government officials, automotive plants are being installed that will provoke an imminent crisis in the water supply for human consumption. Under a plan devised during the administration of Vicente Fox, water will be diverted to factories for automobile exports. He reported that the production of a single car requires 400,000 liters of water. At the close of the hearing the jury produced a preliminary report. The jury was made up of: Patricia Ávila, civil engineer, masters in urban development and doctor in social anthropology; Martha Bañuelos, Masters in Political Science (FLACSO) and human rights specialist, Universidad Complutense de Madrid; Narciso Barrera Bassols, Masters in rural development and social anthropology and professor at the Universidad de Puebla; Laura Carlsen, director of the Americas Program, international political analyst, writer and commentator; Juan José Consejo Dueñas, biologist, Masters in Science UNAM, exdirector of the Sian Ka’an Biosphere Reserve in Quintana Roo; and Felipe Macías Gloria, Doctor in Social History and professor of Water Sciences at the University of Guanajuato. The preliminary statement of the jury found that “…in all the cases presented we found a severe disruption of the hydro-social cycle—that is to say the balance between water and society—characterized by, among other things, overexploitation, pollution and diversion of water. The preliminary statement cited “the model of development based on urban-industrial growth and agriculture for export” as the root of the water crisis so vividly presented in the statements and studies of participants. Two basic energies for Mexico are in danger: the energy that moves machines (oil and electricity) and the energy that moves people (food). Both are essential public goods that are about to fall into private hands. To privatize oil profits and the electricity industry, the government of Enrique Peña Nieto will have to move its proposed legal reforms through blood and fire. However, there is another privatization already underway, of similar proportions, which is being carried out effectively without any consensus or any reforms: that of corn. Corn, whose National Day is celebrated this coming Sunday, Sept. 29, for the fifth consecutive year through the initiative of a large number of peasant, indigenous, academic and artistic organizations of all kinds, is the basic factor and organizer of our food system and the rural economy. It is the most important vegetable raw material on the planet and the nutritional staple of Mexican families, especially those with lower incomes. In turn, it forms the core of the rural economy, especially in the centre and south of the country. Around it develops the diversity of plants that grow in the milpa [traditional fields centred on corn]: beans, chilis, pumpkins, huitlacoches [corn fungus], etc. This diverse production, when it occurs, allows proper nutrition and relatively self-sufficient households. The key to the farmers’ crop productivity is diversity: both the types of plants that live in the milpa, and in the multiplicity of races and varieties of corn adapted to the very different latitudes, altitudes, climates and soils of Mexico. All this is being threatened by the “pincer” strategy of transnational agrochemical company, Monsanto, its allies and recent federal governments. On the one hand, they are pressing for and tolerating the introduction of genetically modified seeds into our country, such as cotton and peanuts. But the real goal is to impose transgenic corn in the soil where it originated. Under the pretext of increasing corn production, making it more resistant to drought, pests and frost, Monsanto and various associations of producers, including CNC [National Confederation of Campesinos], are pushing for the massive release of transgenic corn, until now prohibited by law. But besides this tolerance of the silent invasion, the federal government, or federal governments, the research infrastructure of the few institutions that care for and develop Native corn have been dismantled. An exemplary case is that of INIFAP [National Institute for Forestry, Agricultural and Fisheries Research] of the Sierra of Chihuahua. This public research centre has done an excellent job in at least two major areas: developing oat seeds, such as the variety Páramo, that are resistant to drought and climate extremes and which have had great success and are now grown as far away as Russia. But above all, it has carried out a patient, thorough and very valuable collection and preservation of native corn varieties originating in the mountains of Chihuahua. But the federal government caters to Monsanto and seeks to dismantle INIFAP Sierra de Chihuahua. It has dramatically reduced budgets to the point that it is virtually impossible to undertake research and collecting trips, the positions of staff who retire or change positions disappear, which means the technical-scientific team is reduced to a minimum. However, other centres of the same institute, which are oriented to commercial agriculture or export, receive preferential treatment. This pincer movement is the government’s strategy to deliver corn to transnationals and make transgenics predominate, thereby letting the enormous diversity of native corn die by starvation or invasion. It is proved that this would have all kinds of serious damage: environmental, productive, economic, social and political. It would make us become even more dependent on foreign imports for our basic food; it would sink the rural economy below the waterline; it would wipe out the biodiversity of our countryside. Homogenizing corn cultivation means that only those who can afford the very expensive Monsanto seeds can produce it. It means ending the diversity of corn, which will lead to famine. Fortunately, resistance to this emerged long ago and reveals itself (and rebels) most clearly on National Corn Day. 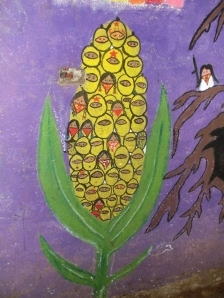 They conduct campaigns such as “Without corn there is no country”, groups like Seed of Life, indigenous community ranging from the Mixtec [in the south] to Rarámuris [in the north] and many more. Peasant organizations, core activists, academics, artists have filed their complaint in multiple national and international forums, most recently before the Permanent Peoples’ Tribunal. They don’t just protest; they preserve native seeds, they evaluate them, improve them, multiply them. 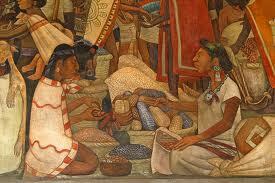 They inform, raise awareness, revive and promote cultural events, because corn is also culture. This creative, diverse resistance, with its deep cultural roots and a food and agriculture project firmly based in them, is what has so far prevented the federal government from granting permission for the release and massive planting of genetically modified corn, which has defended our corn from privatization attempts. It is a resistance that needs to make itself visible and be widely disseminated. Like the other resistances that flourish today in order to claim a future that takes up the best in our history. Alberto Patishtán Gómez, who has been in prison for 13 years, said that his brain tumour, which was operated on last year, “is growing”, so he will soon be undergoing radiotherapy treatment for six weeks. “In the MRI scan that I had (a few months ago) they found out that the tumour is growing again and perhaps I will be hospitalized, but I cannot say how it will go”, he said at a press conference in the prison which is located 20 kilometres from this city. 12 days after the first collegiate circuit court, based in Tuxtla Gutierrez, ratified the sentence of 60 years in prison against the teacher from the municipality of El Bosque, he reiterated his innocence and demanded “that they give me back my freedom”. – What do you think about the Senate proposing an amnesty law to free you? He was asked. – What I have said is that I am innocent, I just need my freedom; if they give me back my freedom that is all I need. At the press conference, the bishop of Saltillo, Coahuila, Raúl Vera López, said the court’s decision is a sign of weakness; (the government) thinks that is showing power but faced with logic, reason and justice it is just showing weakness, it is a syndrome of power not to want to show weakness. Vera López entered the prison in the morning to officiate, together with the bishop of San Cristobal, Felipe Arizmendi Esquivel, at a Mass to celebrate the Day of the Prisoner. During the ceremony the El Bosque Movement for the Liberation of Alberto Patishtán gave the Tzotzil in prison the “recognition of innocence”, which the judiciary had denied him. 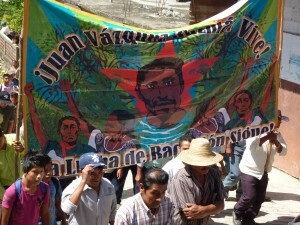 “The people of El Bosque have risen up because they are witness to my innocence, like other sectors, but unfortunately the authorities have closed their ears, they have not been able to hear or see, and again they have left me in jail so that I complete the 60 year sentence imposed on me”, said the teacher, who was also visited today by officials of Section 7 of the National Union of Education Workers (SNTE). “In the eyes of God, from the early days when I was arrested I am innocent, I have not done anything, within my conscience I do not owe anyone, I am innocent, I have not committed the crimes of which I have been accused, and this keeps me in peace to keep fighting and demanding my freedom. The authorities do not want to recognize this, I understand that at times ambition has blinded them, so that they cannot see things”, he said. He emphasised that “it is sad to see that those who have actually committed other crimes are those who leave (prison); those who have economic power achieve their freedom through influence. Freedom was denied me, perhaps because of my colour, my deficiencies, my poverty and my being indigenous, but I will not lose hope, I will keep fighting”. The most significant change in the state government of Chiapas took place in July when Manuel Velasco Coello, governor of the state, named Eduardo Ramírez Aguilar as the new Secretary General of Governance, replacing Noé Castañón in this charge, who had held the position during the majority of the previous government of Juan Sabines. Another critical case is that of Colonia Puebla, Chenalhó municipality, where new aggressions that seem to have a religious basis coincided with the release of yet another group of those accused and incarcerated for the Acteal massacre of 1997. On 10 June, Catholics from Chenalhó denounced the looting of the land on which their chapel and construction materials are located, actions in which the ejidal authorities took part. On 18 June, they carried out a pilgrimage-march to Chenalhó so as to denounce the lack of attention from authorities. A month later, tensions increased once again when members of an anti-Catholic faction supported by ejidal authorities dismantled the construction site of the chapel. On 20 July, two persons, Mariano Méndez Méndez and Luciano Méndez Hernández, were detained and accused of having poisoned the community’s water supply. Both are from support bases of the Zapatista Army of National Liberation (EZLN). A third person, of Baptist denomination, was arrested for having manifested his opposition to such measures. They were released three days later, after no evidence was produced tying them to the charges of poisoning. But the problem at its root continues without resolution, this despite the signing of a civil pact on 8 August. The Las Abejas Civil Society has denounced that “the paramilitaries from Chenalhó are now reactivated, firing their weapons and causing displacements as they did previously in the year 1997.” Near the end of August, more than 90 persons (Catholics and two Baptist families) had fled Colonia Puebla. Besides this, on 29 June, more than a thousand units of the state police invaded the Extraordinary Congress being held by Section 7 of the National Union of Educational Workers (SNTE) in Tuxtla Gutiérrez. As a part of this show of public force, more than 200 teachers were injured, some seriously, and 29 arrested, though they were released soon thereafter. It should also be mentioned that women organized from the municipality of San Cristóbal de las Casas have declared a “Gender Violence Alert” amidst the refusal of the authorities to take adequate measures to detain violence against women in Chiapas. It has been calculated that there have been seen more than 55 femicides, and that dozens of women have disappeared since the beginning of the year. Another source of mobilization has been related to prisoners. In June, upon completing 13 years’ imprisonment, events were once again organized to demand the release of Alberto Patishtán Gómez, an indigenous Tsotsil professor who is a member of the Voz del Amate, presently being held outside San Cristóbal de Las Casas. There was held a mass outside the prison, with hundreds of participants emphasizing the urgency of the matter. 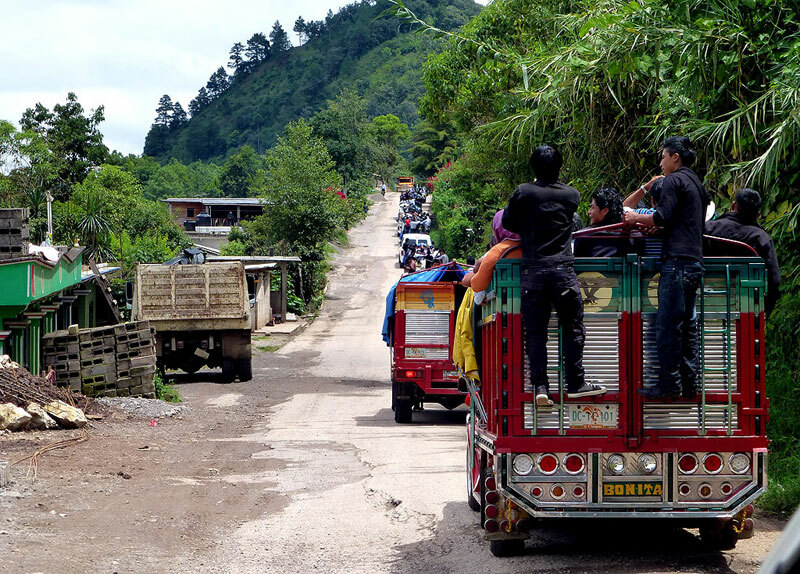 On 4 July, nine prisoners who adhere to the EZLN’s Sixth Declaration of the Lacandon Jungle were released, an event also attended by governor Manuel Velasco Coello. However, neither Alberto Patishtán Gómez nor Alejandro Díaz Sántiz, a prisoner in solidarity with the Voz del Amate, were released on this occasion. In August, Amnesty International has added its voice to the call for the release of Patishtán. It was a privilege to attend as a student the first grade course “Freedom according to the Zapatistas”, which was run in parallel in various territories of the autonomous governments, as well as in the Indigenous Centre of Integral Capacity Building –Unitierra, in San Cristóbal de Las Casas, Chiapas, from 12th to 17thAugust. Because of its many meanings – political, strategic, programmatic and tactical – in the current tragedy of a country devastated by the government of national treason and its corporate-repressor associates (including organized crime), the course imparted by indigenous peoples from the different ethnicities which make up the autonomous Zapatista governments constitutes an urgent call to the national conscience, to the men and women with dignity and integrity to organize, resist and struggle for a better world where those who govern obey the peoples, based on the seven principles: 1. Serve and don’t self-serve, 2. Represent and don’t supplant, 3. Construct and don’t destroy, 4. Obey and don’t order, 5. Propose and don’t impose, 6. Convince and don’t conquer, 7. 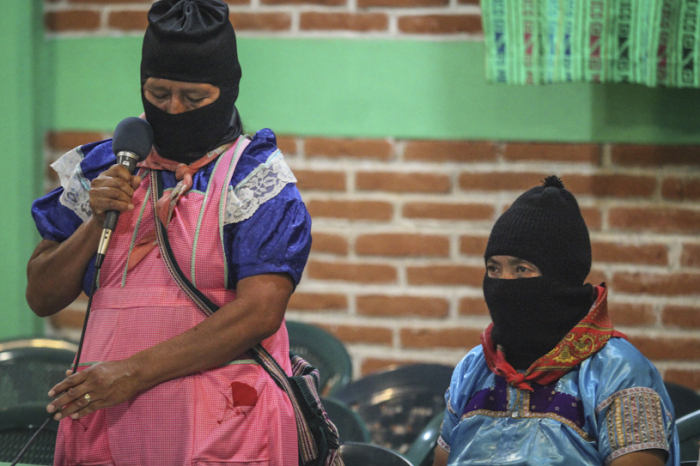 Go down and not up, and based on the maximum ethic that reigns in the EZLN: “Everything for everyone, for us, nothing,” that is, the opposite pole of conduct to that with which the Mexican political class acts. In the conveyance, participation and thematic content of the course, they emphasized the scope and victories of women in the autonomous governments, in the commissions of education, health, productive projects, in the changes that take place in day-to-day life, domestic work and care of children, as well as in sports and public events. Here also, the women teachers remembered how in clandestinity the integration of women started in the militias, in the ranks of the insurgents, making clear the current gender parity in the three levels of government. The machistas (macho men), who still exist, are now faced with the autonomous authorities, the assemblies and the right of women to report any mistreatment. If the woman holds a position, “the compañero has to take care of the children, make the food, wash the clothes,” my Votán commented to me. Many more themes were treated, all with depth, a sense of humour and frankness, with pride in all they have achieved, but with modesty. On finishing the course the moment arrived to say goodbye to the teachers and Votáns, with a lump in our throats and many openly crying. For the graduates of the Escuelita, the world will not be the same. Given the growing world population, the issue of hunger and food needs is crucial, but it is rife with erroneous assumptions. Almost all governments and the international community that deals with the issue of food start with the premise that we need the industrial chain and its technologies to feed ourselves, both in the present and to meet future challenges. Farmers and other small food producers are seen as almost folkloric: they exist, but they are marginal, and they don’t play an important role in food. It is also the slogan of the transnationals and scientists who are funded by them: given population growth and climate chaos, without industrial and transgenic seeds, without industrial monocultures, machinery and lots of supplies and pesticides, the world will be even hungrier. But the hard data show an inverse reality: it is precisely the industrial chain, the multinationals and their technologies,that are exacerbating the crisis and producing more hunger, while the campesino networks and other “small” farmers are those who feed the majority. Since 2009, the global food market, from seeds and agriculture to supermarkets, has been the world’s largest market, surpassing energy. Being also an essential item for survival, it is not surprising that the multinationals have acted aggressively to control it. The process didn’t take long: in technology some fifty years, with the so-called “Green Revolution”, and in new regulations to favour market oligopolies, just a couple of decades. From Monsanto to Walmart, a score of multinationals now control most of this lucrative market. That the multinationals dominate the industrial chain of food production does not mean that they feed the most. Although they control about 70 per cent of the global agricultural resources (land, water, supplies), what they produce reaches only 30 per cent of the world’s population. Most of the food still comes from the hands of rural farmers, indigenous people, fishermen, pickers, neighbourhood and urban gardens and orchards and other small producers. With just 30 per cent of agricultural resources, they feed 70 per cent of humanity. The industrial chain wastes two-thirds of its food production, destroys soils and ecosystems, causes enormous damage to health and the environment, and for that, 3.4 billion people, half the world’s population, are malnourished: hungry, malnourished or obese. The peasant and small producer network of food suppliers have a minimum level of waste, use and care for an enormous variety of foods that are healthier and have much higher nutritional content, and with low or no environmental impact. Even negative, because they counteract the devastation caused by the chain, as in the case of climate change. This is even taking into account that most of the farmers use some agrochemical. In order to provide that 30 per cent of food, the industrial chain uses 70-80 per cent of the arable land, 80 per cent of fossil fuels, and 70 per cent of the water destined for agricultural use. It also causes 44-57 per cent of greenhouse gases, deforests 13 million hectares [32 million acres] of forests and destroys 75 million tons of vegetative cover [shrubs, trees] each year. The peasant network harvests 60-70 per cent of food crops with 20-30 per cent of the arable land, uses less than 20 per cent of fossil fuels and 30 per cent of the water intended for agricultural uses, nourishes and uses the biodiversity and is responsible for most of the 85 per cent of food produced within national borders. It is the chief, and often the only, provider of foodstuffs that reach two billion people suffering from hunger and malnutrition. To these data are added many others about the output per hectare, jobs, land, water, fisheries, forests, seed and microbial diversity, pollinators, agricultural research, patents and monopolies, animal production and related impact, health and environmental impact, which shows similar and often unknown realities not only for governments, but also for many of us. The document, entitled “Who will feed us? Industrial Chain versus Peasant Network”, has been compiled from more than a hundred sources, of which the majority come from such United Nations agencies as FAO [Food and Agriculture Organization], UNEP [UN Environmental Program], UNDP [UN Development Programs], UNCTAD [UN Conference on Trade and Development]. The remaining data come from academic or civilian research institutions, which cite reports that are in turn based on hundreds of sources, such as those produced by GRAIN and OXFAM. *Silvia Ribeiro is a researcher with the ETC Group, Action Group on Erosion, Technology and Concentration. 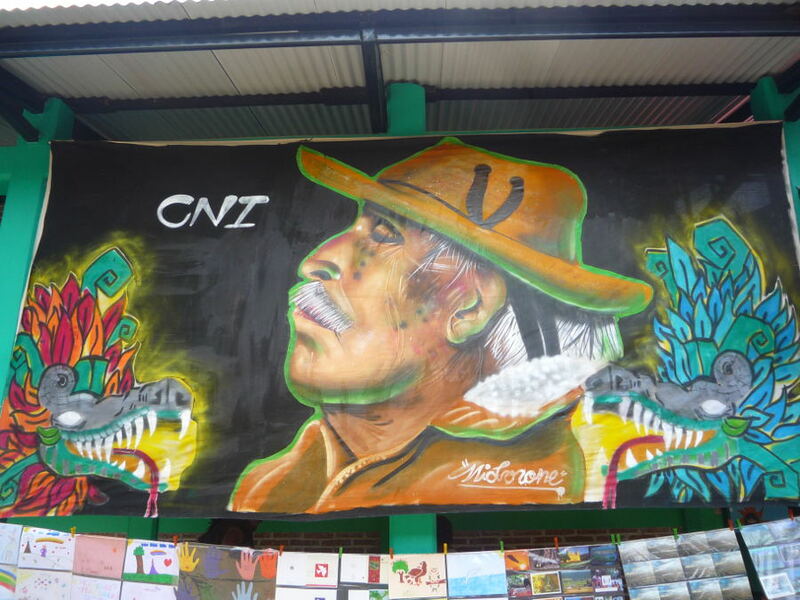 Following the course at the Zapatista Escuelita, a meeting of the National Indigenous Congress (CNI) was held on the 17th and 18th of August in San Cristóbal de las Casas, Chiapas. The meeting turned into a dramatic denunciation, with compelling testimonies of the war waged by the government against indigenous communities throughout Mexico. The testimonies told of how the government uses repressive forces to protect capitalist corporations, which, together with the forces of organized crime, has resulted in the invasion of territories, the plundering of resources, criminalisation of resistance, impacted the environment and threatens the survival of indigenous community life. One by one, the delegates of the various ethnicities-indigenous communities-tribes-nations set out the nature of the offences committed against them, indignant against the powerful who “do not respect their promises, the promises that they betray and violate time and time again throughout this country called Mexico”. The CNI, which came into existence as a result of the San Andrés dialogues initiated by the Zapatista Army of National Liberation (EZLN), protested for the immediate release of all political prisoners in Mexico, especially in the case of Alberto Patishtán, a member of the Tzotzil indigenous community, who has now been imprisoned unjustly for 13 years, and is serving a 60-year sentence. This is a typical case, representative of the numerous indigenous people in the country who are serving prison sentences or have been issued arrest warrants for defending their territory, water, forests, the earth or sacred places; for opposing the presence of the mining, wind farm, tourist, and pharmaceutical corporations, the builders of dams, thermoelectric power stations, gas pipelines and motorways; for standing up to organized crime and the paramilitary groups as members of the community police and self-defense groups are doing in collective organizations; and for reclaiming their rights as indigenous people according to the Constitution and international jurisprudence on the subject. In the almost 100 conflicts that were denounced before the members of the Clandestine Revolutionary Indigenous Committee, General Command (CCRI-CG) of the EZLN, the common denominator was the fact that the Mexican State, in its diverse ambits of authority and levels of government, appears to implement public policies and carries out illegal acts which are contrary to the good of the people, instead acting as protector of the corporations, the majority of which are foreign, and as accomplice of the criminals throughout the territory. In the narrative of the National Indigenous Congress, the police and armed forces are cast as occupying armies, more worried about keeping the community police under control, as in the case of the Regional Coordinator of Communal Authorities-Communal Police (CRAC-PC) of Guerrero, than the assassins themselves, and in some regions, such as Michoacán, are openly in collusion with cartel bosses. “When we defend ourselves, they pursue us, jail us and kill us. They accuse us of breaking the law and they sentence us to years in prison, as if we were criminals. In reality, they are the real criminals, traitors. They are free, as though what they have done to us were not a crime, because of their laws, and with these laws they protect themselves”. The Zapatistas leave a clear message for the bad governors: “We will not, as indigenous people, allow that they take our mother earth and natural resources. 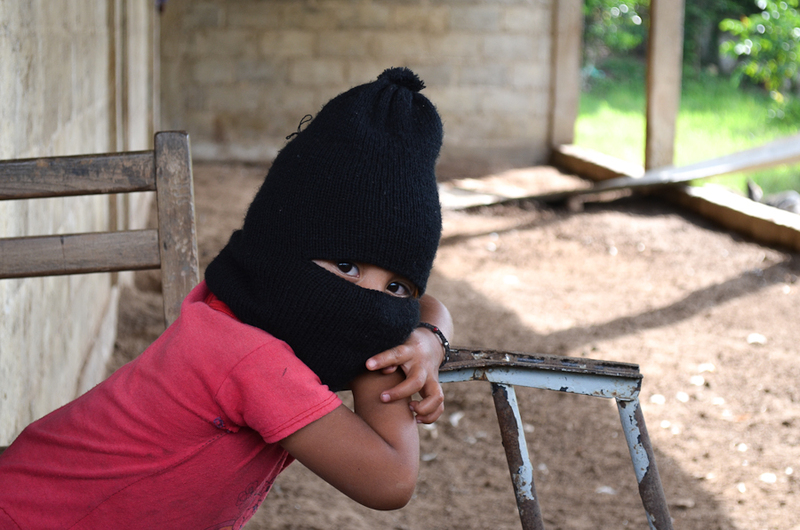 We, as Zapatistas, fight for our 13 demands for the Mexican people, and we also fight for autonomy, where the people are in command and the government obeys. To achieve all of this we will need awareness, will and sacrifice, and to resist all types of attacks. Colleagues, brothers and sisters, to be able to reject all the death plans that the neo-liberals impose we need to organize ourselves, unite our forces, our pain, unite our rebellion and fight for democracy, liberty and justice”. The delegates decided to recognize, support and encourage the fight for autonomy and free determination of all the people who make up the CNI, from the Yucatán peninsula to Baja California, making the future of the people their own. The Tlachinollan Human Rights Centre denounces that hurricane victims in the Montaña region have been treated as though they were invisible. To date, the government has not taken action to deal with the damages caused by the recent storms in this region. On the other hand, Tlachinollan has confirmed that in semi-urban centres such as the municipal seat of Tlapa, the situation is becoming alarming due to the fact that the city is cut off due to the damage to highways that connect it to Chilpancingo, Puebla, and Marquelia. This is already causing a scarcity of gasoline and food, and various neighbourhoods remain without telephone service and electricity. Faced with this situation, the Tlachinollan Human Rights Centre laments that the situation of the victims in the Montaña region has not received sufficient attention, neither from the public nor from government agencies, being that the region’s extremely poor suffer the worst consequences of these natural disasters. Once more, the marginalized are also the most forgotten. Therefore, Tlachinollan calls for emergency measures to deal with the situation of victims in the Montaña region and demands that the extraordinary funds that are delivered to Guerrero state authorities incorporate mechanisms of transparency and oversight in order to avoid discretional use for political gain, because such embezzlement is unfortunately frequent in the state. Finally, the Tlachinollan Human Rights Centre calls upon civil society to support the solidarity campaigns that seek to collect food for the people in Guerrero who have been affected by the rains, given that the situation the state faces is critical. On September 13th, 2013 teachers of the CNTE (National Commission of Education Workers) who have been on a nationwide strike against the privatization of education for nearly two months, were violently evicted from the protest encampment at the nation’s capital. The teachers have regrouped at a new location and plan to take back their original encampment on the 18th. After almost a month of maintaining an expanded encampment in the central plaza of Mexico City, holding daily marches, rallies, blockades, and other actions in defence of worker rights and free, public education, the schoolteachers belonging to the National Education Workers Coordinating Group (CNTE) were moved out with extreme violence by federal police in an operation that began a little after 4 o’clock in the afternoon last Friday, September 13. Mexican President Enrique Peña Nieto and Mexico City Mayor Miguel Mancera had both decided that the teachers would be a disturbance for their September 15-16 festivities when the Cry of Independence is traditionally given in the Zócalo. In the face of a heavy deployment of 3,600 militarized police and continuous low flights of Blackhawk helicopters overhead, talks were held with the CNTE leadership in which the federal Secretary of State Miguel Osorio Chong, through his Mexico City counterpart Héctor Serrano, gave two ultimatums for the entry of the police: the first at 2 pm and the second at 4 pm. The majority of the teachers began to leave the plaza that morning, but several groups of Oaxaca’s Section 22 teachers stayed to put up resistance. A little after 4 o’ clock, thousands of federal riot cops under the command of Manuel Mondragón y Kalb charged into the Zócalo, backed by tanks shooting torrents of water and teargas. They came from Moneda, Guatemala and 5 de Mayo streets to the north of the Zócalo, forcing people to pull back towards the south to 5 de Febrero, 20 de Noviembre and Pino Suárez. Dozens of teachers and supporters had already put up barricades on these streets and met the police with a hail of rocks, sticks, and other flying objects. Confrontations took place at Izazaga Street, as well as Arcos de Belén, Eje Central, Ayuntamiento, 16 de Septiembre and others. The repression included encirclements and beatings that resulted in dozens of people wounded and, according to the Cerezo Committee, 31 arrests. All have now got out on bail. Nevertheless, there are still dozens of people unaccounted for since September 13, and it’s not yet known whether they simply haven’t reported in or if they’ve been disappeared. On the 13th, there were teacher marches and actions in a number of other cities, and the support was especially strong in Veracruz and Oaxaca, where the Zócalo was occupied by the FUL-APPO. In Xalapa, Veracruz there was heavy repression and several arrests were made. As a result of the violent repression in Mexico City, the teachers lost most of the few belongings that they had with them, and are now camped out at the Monument to the Revolution in harsh conditions. There is a call for people to bring them sheets of canvas or plastic, blankets, medicines and other supplies. The CNTE is now getting reorganized and a number of solidarity actions have been held in their support. A huge march was held on September 15, and more than 100,000 people gathered at the Monument to the Revolution to give the Cry for Independence, more than twice the scant number attending the official festivities. Several actions planned for this week, including a march to take back the Zócalo on Wednesday September 18, and work stoppages at the end of the week. There are student strikes at several universities, where centres have been set up to gather supplies for the teachers.